I don't really read science fiction novels much these days. With as many science fiction short stories as I read in order to assemble The Year's Best Military and Adventure SF series, when it comes time to wind down with a book, I find myself reaching for different genres. When I do read a science fiction novel, I tend to gravitate toward older works that I've meant to read but haven't gotten around to. All this to say, if a science fiction novel came out in the last three or four years, there's a stunningly good chance I haven't cracked its spine. But I made an exception for Lou Antonelli's Another Girl, Another Planet. The premise was just too interesting. I couldn't resist. With Another Girl, Another Planet, Lou Antonelli gives us the 20th Century we deserved rather then the 20th Century we got. It's an alternate history story in which Admiral Robert A. Heinlein (yes, that Robert A. Heinlein) convinces the United States and the U.S.S.R. to work together on a joint space program, rather than against one another in an escalating arms race. As a result, by 1985 (when our story is set) there is a thriving colony on the Moon and the frontier has moved to Mars. The hero of the story is Dave Shuster, a low-level bureaucrat who is sent to the Mars colony to take over a vacant administration position. Once there, however, he discovers that the Martian governor has died while he was en route. Shuster is now interim leader of the colony. The engine for Antonelli's plot is an Asmovian mystery involving a mysterious robot and android factory on Mars and a missing girl (an old flame of Shuster's) back in New York City. The mystery is well-done and kept me turning pages, and Shuster, who narrates the novel, is a likable protagonist with a great voice. But the real joy of the novel is the world that Antonelli has created. For one thing, it's incredibly well thought out. More than that, it's just downright fun. In Another Girl, Another Planet, familiar faces from our timeline turn up in different settings throughout. Familiar technology such as fax machines exist alongside Moon-to-Mars rocketships. To say too much would be to ruin the fun of the novel, so I'll just mention two things that typify what I'm talking about. The first is when Dave Shuster finds a cassette of Buddy Holly's early material, from 1957 - 1961, before he and The Beatles became engaged in the U.S. vs. Britain Music Wars. Another is that we find out what happened to famed skyjacker D.B. Cooper in this timeline. If I have a criticism to level against the novel it's that, from time to time, the forward movement of the plot is sidelined so that some aspect of the alternate timeline and/or retro-futuristic technology can be explained. But these diversions are so entertaining that it's hard to say that they should have been cut. I certainly would have missed them. Readers not as enamored with 20th Century history and pop culture might find themselves a little lost in all of the references, but I suspect that, for the most part, they will just sail on by, not causing a distraction. 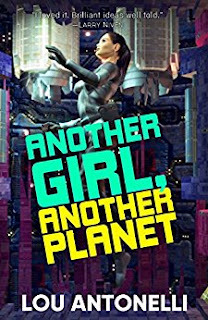 Published by Kevin J. Anderson and Rebecca Moesta's Wordfire Press, Another Girl, Another Planet is available now. Here's a link to it on Amazon. Or, if you prefer, you can buy a DRM-free version from Baen.com. If there were more books like Lou Antonelli's Another Girl, Another Planet, I'd read a whole lot more modern science fiction novels. Highly recommended.